A large sign outside the Lincoln Highway Association headquarters in Franklin Grove, Ill., gives travelers a rough mileage to various spots along the route, including New York and San Francisco. A hundred years ago, a new era of transportation in America was ushered in, when the Lincoln Highway was dedicated. For the first time, Americans could drive on one designated route from coast to coast. 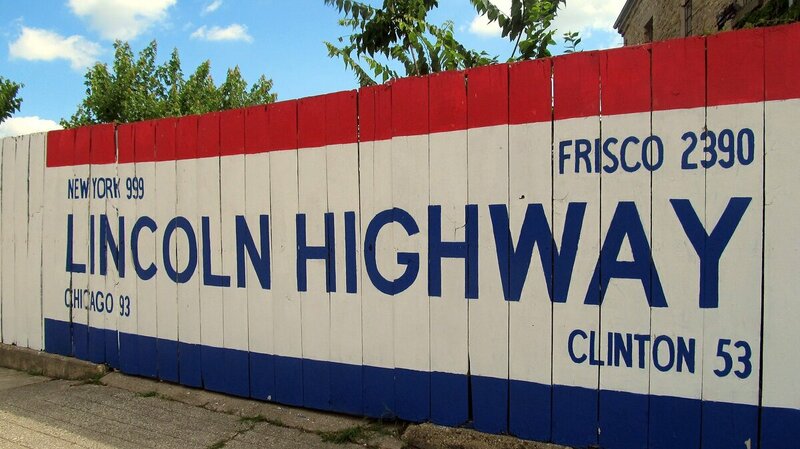 The Lincoln Highway still exists in old maps and in the minds of its dedicated fans. The Lincoln Highway Association has charted the old route on Google maps. Kay Shelton, president of the association and a professor at Northern Illinois University in DeKalb, told All Things Considered host Robert Siegel that it was not a highway construction project — it wasn't about building a brand new roadway — but rather a route-making process. "The Lincoln Highway's really made up of a patchwork of already existing roads," Shelton says. The route was intended to be the straightest possible shot between New York City and San Francisco. It was updated when newer, straighter or smoother legs were found, but Shelton says it still took about a month to get across the country. The road was the brainchild of Indianapolis Motor Speedway founder Carl Fisher. Industrialists Frank Seiberling of the Goodyear tire company and Henry Joy, who was president of the Packard Motor Car Co., helped him realize the idea of an improved coast-to-coast highway. America's roadways at the beginning of the 20th century were far from the advanced network of smooth highways we have today. At the time, some cities had brick roads or laid wooden planks to make smoother streets, but once you got into the country, roads were little more than rutted dirt paths. In an era when cars were still novel, these captains of the auto industry thought making a better roadway would spur interest in driving. "They knew that people would not be interested in cars unless there were improved roads to take their vehicles on," Shelton says. "That was goal of the Lincoln Highway ... not only to promote the vehicle and travel but to show people what improved roads could be like." If Fisher had his way, Shelton says, the road would have been called the Coast-To-Coast Rock Highway. But he was persuaded to name the road after America's 16th president, making it the first national memorial to Abraham Lincoln. In the end, America's Main Street, as it came to be known, was not long for the world. By the mid-1920s, state and federal governments had started to take more control over American roadways. In 1925, a newly formed Joint Board on Interstate Highways created a system of numbered, not named, highways. The original Lincoln Highway Association, which was charged with caring for and promoting the route, ceased its activities in 1928, marking a functional end to the roadway.